Radiation oncology is a medical specialty that involves treating cancer with radiation. Doctors who specialize in treating cancer with radiation use radiation therapy to treat a wide variety of cancers. But coding for radiation oncology involves more than just coding radiation therapy. Radiation oncology is made of a variety services that are all used in tandem to adequately treat the patient, these services include: Consultations, Preparation for treatment, treatment delivery, and treatment management. 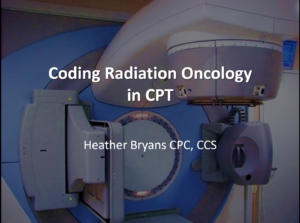 Understanding how and when to report these services seem at times quite difficult; in this session we hope to show you just how reporting radiation oncology services can be and get you started on the road to successful coding. Utilize learned information to make logical decisions regarding coding for radiology services. Describe key CMS rules and regulations specific to radiation oncology procedures and apply this knowledge in their own facility.